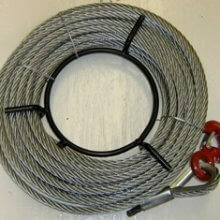 Available in 8, 16 & 32kg options with wire rope lengths to suit you. 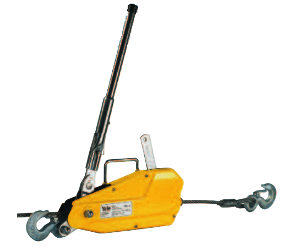 Lightweight and compact for lifting, pulling & tensioning tasks. 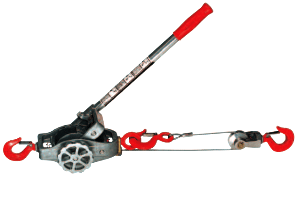 The Yaletrac cable puller system is manufactured from aluminium and incorporates only quality components. 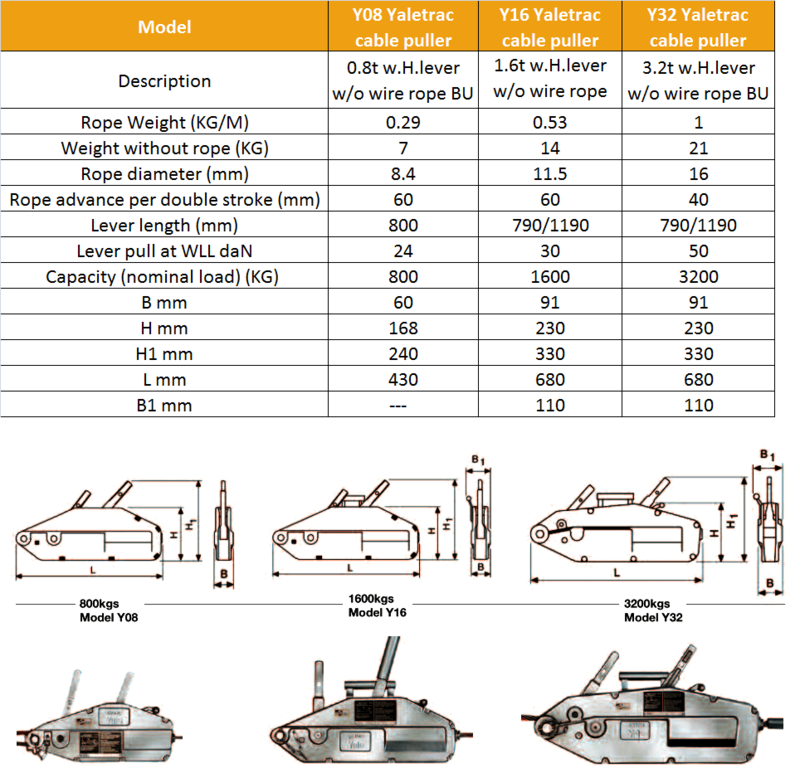 There are three models in the Yaletrac wire rope pulling machine range with working load limits of 800kg – model Y08, 1600kg – model Y16 and 3200kg – model Y32, all available from Lifting Hoists Direct. 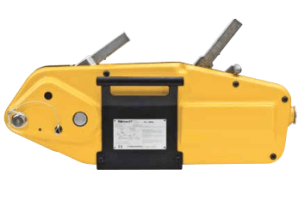 Yaletrac wire rope pullers are compact and lightweight with the two larger models incorporating carry handles for user convenience. They are very easy to move around and great for keeping in your work vehicle. 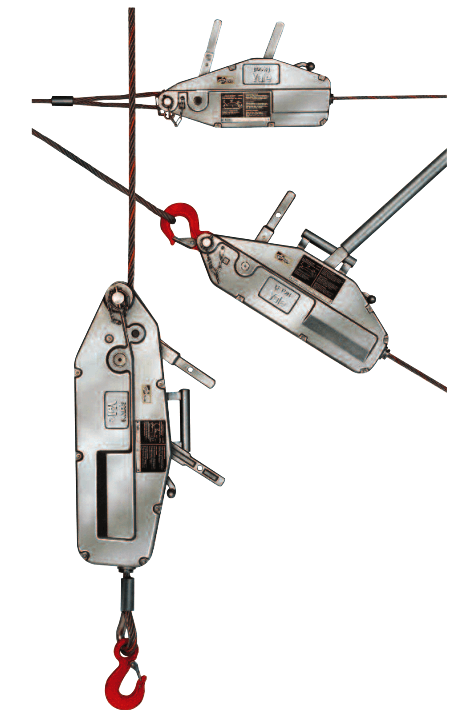 These wire rope cable pullers can be used for many types of lifting, lowering, pulling and/or tensioning operations and are ideal for load securing. Because a cable puller can be fitted with any length of wire rope they can be used to pull and lift over very long distances. Cable pullers are commonly used in the construction industry and in agriculture, civil engineering, ship building and many more; in fact their uses are endless. The Yaletrac range incorporates a wide, flat bottom which much improves their stability, especially when used in a horizontal orientation. Both the forward and reverse operating levers are in line. They not only allow the slim design, but also to ensure the power and forces are transferred along its central line. The separate operating hand lever fits easily onto either lever for easier forward and reverse operations. 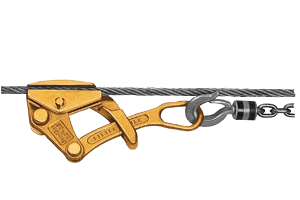 There is a lever to disengage the clamps to enable free threading and removal of the wire rope. The clamping system has been designed in a parallel arrangement in order to better protect the rope by distributing the clamping forces more evenly. The forward lever contains the sheer pins which provide the overload protection on these devices. Spares are supplied and are located in either the handle or operating lever. If the sheer pins fail they can be replaced relatively easily without the need for removing the load. 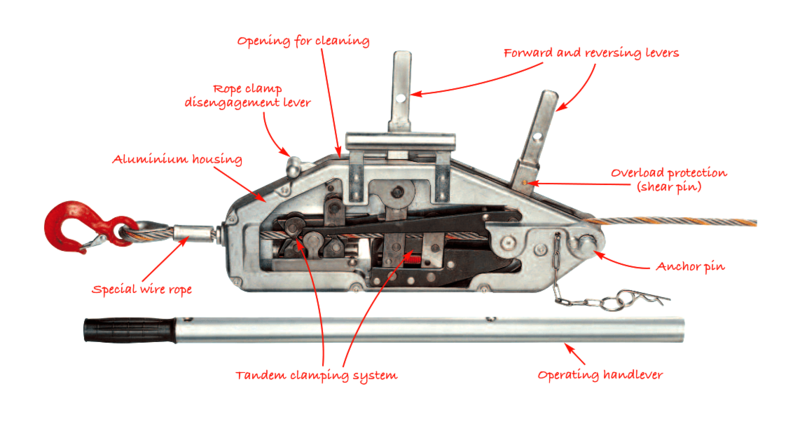 Each lever stroke provides quite a long rope advance and in turn speeds up the task. 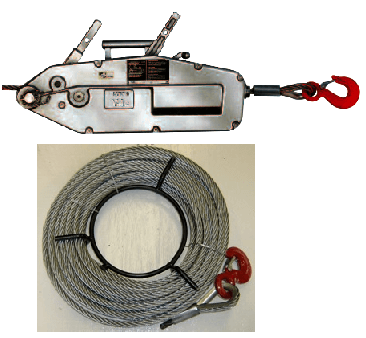 Yale wire rope pulling machines are supplied as a unit only without the rope. This is in order to supply each customer with their specific length. 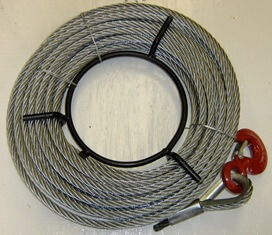 10, 20, 30 & 50 metres are the standard lengths available. 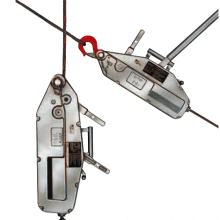 The wire rope used for these cable pullers is a flexible, six stand construction with a steel core. It is fuse and tapered at one end for easy threading into the cable puller housing. The other end has a thimble eye which is fitted with an eye, sling hook complete with safety catch. A further benefit of a Yaletrac cable puller is their easy maintenance. There is an opening in the top of the housing which enables the unit to be flushed through with water for a quick and easy clean;. Motor oil can then be added for continued lubrication. If performed on a regular basis this will keep your wire rope cable puller in good working order for longer. 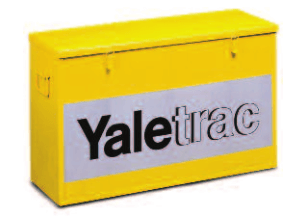 Storage boxes or storage bags are available to store your Yaletrac puller in, these are great if the machine is used infrequently. You can view the specifications and dimensions of each model on the specifications tab.